Darex Work Sharp Knife & Tool Sharpener uses a flexible motor-driven abrasive belt, the same method used by knife makers to put a razor edge on new blades. Spring tension holds the belt securely in place yet allows it to flex around a blade’s edge to shape, sharpen and hone a slightly rounded convex bevel that is stronger and sharper than the flat bevels produced by traditional wetstones and other rigid-surface sharpening systems. 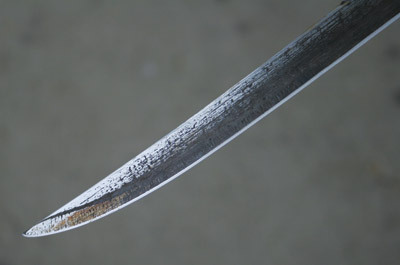 Sharpening to a convex edge also removes less metal and extends blade life. Comes with two sets of belts (coarse, medium and fine) and two guides, one for sharpening kitchen knives (20-degree angle on each side) and another for outdoor knives (25 degrees for a stronger edge). 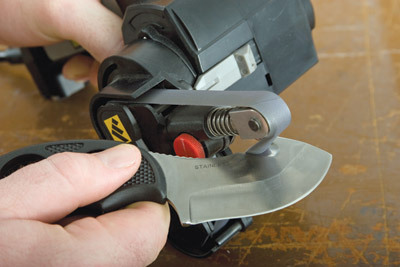 The outdoor knife guide also has guides for sharpening scissors and serrated blades. Slip on a belt and an edge guide, place the Work Shop on a table or bench, and you are ready to sharpen a knife. Just turn on the motor-driven belt and draw the blade slowly through the guide. Now move to the other side of the guide and draw the blade through again, putting the same angle edge on the opposite side of the blade. Repeat five times. For a polished edge, swap the medium belt for the fine and repeat. Gut hooks, broadheads and other items with unusual edge shapes and angles may be sharpened without a guide by simply holding the blade edge angled against the flexible belt. To sharpen axes, lawn mowers and other large items, secure the large blade by hand or in a vise and pivot the Work Sharp grinder head into one of three more straightforward positions for easier handheld use. 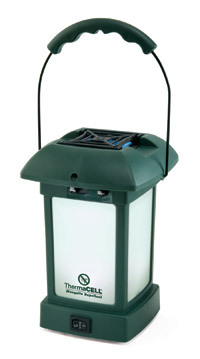 The entire device, including 6-foot electric power cord, weighs about 1-1/2 pounds. 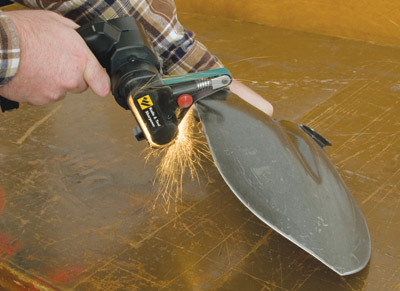 May also be used as a handheld grinder for sharpening a shovel or taking the burr off the edge of a foothold tap jaw. 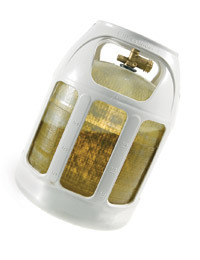 Three-position on/off switch works with finger pressure or can be locked “on” for extended use. 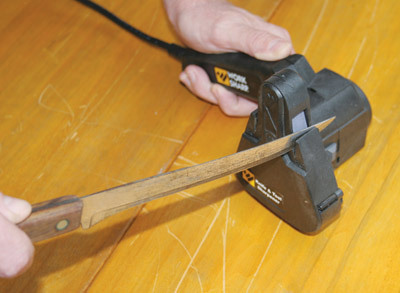 Our test sharpener worked as the company claimed it would, quickly and easily sharpening kitchen knives and a hunting/skinning knife with a pronounced sweep to the blade. It took about 1 minute each to put polished edges on the blades. Belts and guides swapped out in seconds with no tools required.